I have a similar issue after upgrading from BETA6 to v2.2.0.beta8 +11, the favicon’s are not loading or loading and then being replaced with an empty page icon. It’s weird because if I have 3 windows open, one of them will have the favicon and the other two won’t. If I refresh the favicon loads for a split second and then is replaced by a empty page box icon. It was working fine with BETA6. There is a cache on the favicon, you will need to wait around 30minutes before it is properly updated. Waited for about 40 minutes, no change. What’s weird was when I testing it earlier, when I removed the Favicon, it defaulted back to the discourse favicon immediately and that when the page loads it shows the favicon for a split second and then it changes to an empty box. Where next should I look/see/do? For new sites, CSP is on by default. Is this a new install? Nope been there for almost 2 years, just recently updated from BETA6 to BETA8 and now these things have cropped up after the update. You can check your site settings, CSP should be off by default then for an existing site that updated. It will be on by default when 2.3 is released though in summer 2019. Can you check if there is a favicon configured in your site settings? If possible, please provide me with the URL. You can see, just refreshed all the pages, once it shows the favicon, the next time it doesn’t. If possible, please provide me with the URL. Remove Commercials and Ads, Convert Videos and Organize your video collection for your Windows Media Center, DVR, Recorded TV, and recorded videos. Sorry for being incorrect, I won’t do it again. Does anyone have any insight regarding why the test.sands.community site has no mobile icon after the upgrade even though all the icons appear in the admin interface? I’m happy to provide whatever information I can to debug this. You need to set force_https to true in your site settings. So, why this change now? It’s been working fine without this option being enabled (it was disabled just to provide an alternative option to use http incase something happens with letsencrypt/certificate). What changed in this last BETA upgrade which stops the icons from loading and providing the unsafe scripts warning? I can set values but it doesn’t result in these URLs being used for logos as far as I can see, does anyone have any suggestions? It was due to Basic site logos should hit the CDN. Previously, SiteSetting icons that are frequently used were not served via the CDN, if configured. The change made it such that we would generate a full URL for the icon and the generation process looks at SiteSetting.force_https to determine the scheme of the URL. 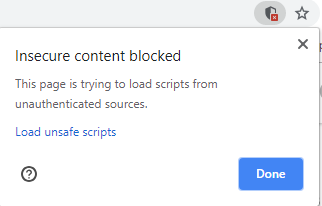 So then I guess the force_https option should be removed, it’s redundant as it can be disabled without breaking the images and also having the browser the unsafe scripts. Having it there (as much as I would like that option to not use https) it just going to create confusion. I still have this issue in the latest version. If it’s the default, why does the Discourse logo appear instead of an icon? Absolutely not, without it all sites running Discourse that have any historic hard-coded insecure URLs don’t get rewritten, and users see a mixed content error. That’s many orders of magnitude worse than a site which has a missing logo due to a broken third-party plugin. If this is a confirmed problem with discourse-images-guardian is it even a bug? Core is working fine, a third party plugin is responsible. Do you mean to say you have a custom logo small previously? Yes, I had a custom logo small previously and I didn’t like it - after that I deleted it and now the Discourse logo appears. With the default settings. …and here: u/username/activity, at Summary & Activity.